Michael Ignatieff, rector of the Central European University, attends a news conference in Budapest, Hungary on March 29, 2017. Even amid the grandeur of Budapest’s Parliament District, the gleaming Central European University building stands out with sleek lines and glass walls designed to reflect the university’s values of transparency and openness. But the liberal CEU faces an uncertain future in Budapest after a 15-month standoff with Hungary’s hard-right government, which increasingly points to the university’s forced exit. The ruling party, Fidesz – led by strongman Prime Minister Viktor Orban − in April won a third consecutive mandate after a virulent campaign that branded CEU’s founder George Soros as a traitor scheming to force migrants on Hungary. The university’s rector, Michael Ignatieff, the Canadian scholar and former federal Liberal leader, says the fight against CEU is an unprecedented attack on academic freedom. “Were a member of the [European Union] to push a free institution out into another country, it would be a scandal,” he told The Globe and Mail in an interview last month. Mr. Ignatieff set a deadline for the Hungarian government to end the impasse: “CEU cannot go into another academic year in a situation of legal uncertainty,” he said. Across Europe, the old liberal guard is battling the rise of nationalist currents that challenge the European project and revile immigration. 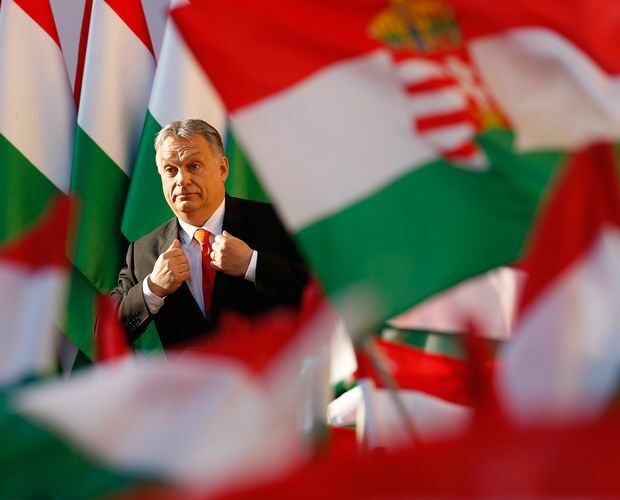 Although several of Hungary’s neighbours also have populist governments − notably Poland and the Czech Republic – it is Mr. Orban who has earned the nickname Viktator. CEU’s fate in Budapest is increasingly a bellwether for the future of liberal thought, education and democratic standards in Europe. In the eight years since he regained power, Mr. Orban has dismantled democratic checks and balances, targeted civil-society groups, taken control of most of the country’s media, tinkered with election laws, erected an anti-migrant border fence and befriended Russia. Hungarian Prime Minister Viktor Orban at a Fidesz party rally in Szekesfehervar, Hungary, on April 6, 2018. “The age of liberal democracy is over,” Mr. Orban said after winning re-election this year. In early May, the Open Society Foundations (OSF) – an international grant-making network also founded by Mr. Soros – announced it would close the Budapest office from which it has disbursed more than €400-million ($605-million) for democratic and civil initiatives over 34 years. The OSF cited Hungary’s “increasingly repressive political and legal environment” as the reason for its move to Berlin. Also ahead is Mr. Orban’s suite of “Stop Soros” laws introducing one-year prison terms for people deemed to have aided illegal migration, which could affect several OSF-funded civil organizations, such as the Helsinki Committee and the Hungarian Association for Migrants. The reaction of the conservative European Parliament bloc to which Fidesz belongs will be important in determining CEU’s fate in Budapest. The president of the European People’s Party (EPP), Manfred Weber has warned Mr. Orban to consider the importance of academic and educational freedom. Last week another EPP member, Andreas Nick, warned Mr. Orban regarding CEU and his upcoming NGO law. Mr. Nick, who is the Hungary rapporteur for German Chancellor Angela Merkel’s Christian Democratic Union party, said: “Our Hungarian friends need to understand that crossing certain lines would make life very difficult for everyone.” Fidesz’s votes are valuable to the EPP, however, and critical words have not yet translated into action against Fidesz. Mr. Ignatieff has been caught in the crossfire between Mr. Orban and Mr. Soros for more than a year now. In March, 2017, the government introduced legislation with the objective of forcing the closure of CEU − one of the top 160 universities in Europe, according to The Times Higher Education. 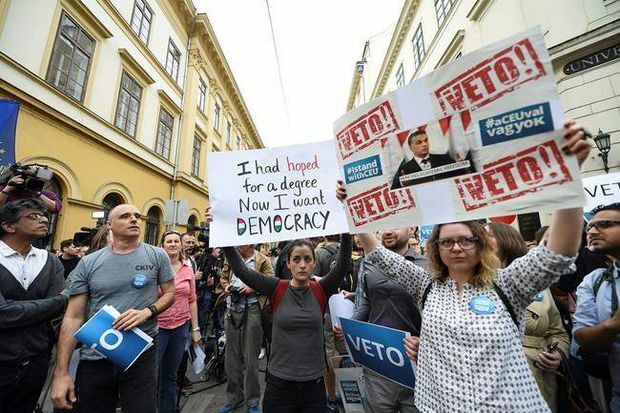 Mr. Ignatieff said at the time the university should be “left the hell alone.” On the streets of Budapest, 80,000 pro-CEU demonstrators shouted their fury while Mr. Ignatieff sought to rally Western governments and Nobel Prize winners against the legislation. In this April 4, 2017, file photo, demonstrators protest against the amendment of a higher-education law in Budapest. Mr. Ignatieff remains resolute. “Looking you straight in the eye, this is what I want to happen: We stay here [in Budapest],” he told The Globe at Muvesz, a fin-de-siècle café in Budapest. But he has been frustrated at every turn. “They just don’t pick up the phone,” he said. CEU opened in Budapest in 1991, in the rush of energy that followed the collapse of communism. It was a triumphant homecoming for Mr. Soros, who had fled Budapest for London in 1947 to find himself under the tutelage of the anti-authoritarian philosopher Karl Popper. By the early 1980s, with wealth accumulated as a financier, Mr. Soros turned to philanthropy. He played a key role in the final years of Goulash Communism, the period of the late 1970s and 80s when Hungarians enjoyed higher living standards and relatively more freedom of speech than most other countries in the Soviet sphere. Mr. Soros sponsored intellectuals and provided computer equipment to opposition movements. The law now stipulates that Hungarian universities − such as CEU − that issue American-certified degrees must also operate a U.S. campus. To comply with that dictate, CEU set out to establish operations at Bard College in New York state. All that remains is for the Hungarian government to sign off on the agreement. A Hungarian delegation inspected the New York campus in March. “Those channels have been completely professional, businesslike and actually positive the whole way through, oddly,” Mr. Ignatieff said. “We have fulfilled our obligations and now it is time for the government of Hungary to fulfill theirs,” he added. “It’s all up to Viktor Orban, always was,” Kati Marton, a member of CEU’s board of trustees, said in an e-mail. CEU students and staff alike know the university’s fate remains uncertain. “We are all working on the assumption that Vienna is going to be a satellite campus, but we are all aware that our future in Hungary is up in the air,” said professor Michael Miller, 48, who heads CEU’s nationalism program. Central European University is pictured in Budapest on April 9, 2018. Espresso Embassy, a nearby café, is jokingly known as an unofficial department of CEU. “I would be sad to lose the milieu: International students, professors, CEU students are such a lovely addition to our otherwise colourful palette of people,” owner Tibor Varady, 39, said. “The current regime is very deeply suspicious of intellectuals and any kind of free thinking,” political scientist Zoltan Gabor Szucs said. As CEU’s moment of truth approaches, Mr. Ignatieff said the university has a great future, whether in Budapest or Vienna. “I’m zen: I’ll deal with whatever comes up,” he told The Globe. “If the Orban government ultimately throws CEU out, I don’t think we have to make a fuss − I think it would just look really terrible,” he said. It would represent “a sad day for Hungarian culture, a sad day for Budapest, its universities and Hungary’s place in Europe,” he added. Editor’s note: An earlier version of this story said Hungary’s Fidesz party won a third consecutive election last month. In fact, the election was in April. This is a corrected version.